For the first time in history Japan has qualified four men for the grand prix final, something that the great Russian team alone has been able to do in the past years. The Japanese team is clearly the richest in the world with a lot of different talented single skaters. Anyway the national champion Daisuke Takahashi was the only one of the four (actually the only one of the six finalists) who had not won a Grand Prix this season getting the silver medal at both Cup of China and NHK Trophy. Daisuke is one of the best male skater in terms of interpretation and the ability of portraying the music while skating. After having some disappointments last season, especially at Worlds where he lost the title with a perfect free skate, he started to get his technical repertoire even riskier. As a result he lost his consistency and some of his great connection with the music in the attempt of landing multiple quads. Yuzuru Hanyu instead is a rising star in the men’s field. He hasn’t been very consistent so far, but he is an amazing talent and could improve to become the best male skater in history. He has an almost perfect short program, built for getting lots of points. His free skate is not so accurate choreographically and he is always very focused on jumping passes so that his interpretation and transitions are poorer than what he shows in his short. But his technical content his extremely high with two quads and two triple axels in the second half of the program. If he can skate clean in both programs he is going to win or at least finish second after a perfect Patrick Chan. Patrick Chan is looking for redemption after a couple of bad skates in the previous competitions. He had some disastrous performances at Japan Open and Skate Canada, improved at Cup of Russia’s free skate and owns the best overall score of the season but still he is not very solid yet. His biggest problem is consistency on the triple axel. Javier Fernandez was the one who beat Patrick at Skate Canada. Javier is a strong competitor and has jumping consistency since early in the season and showed that in his first Grand Prix but at NHK Trophy, where he was strong of a win, he skated an almost perfect short program and then collapsed in the free with several falls. Still he has the most difficult technical content of the competition (attempts three quads in the free skate) even if that doesn’t always come up with the highest scores. 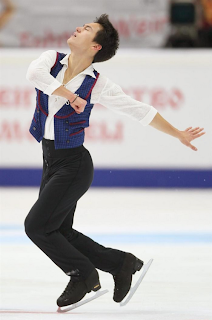 Former world medalist Takahiko Kozuka and Tatsuki Machida will be the other two Japanese men attending the Final. Takahiko Kozuka was an expected entry into this competition, as he was the second Japanese men after Daisuke Takahashi until last season and his beautiful qualities are already known worldwide. On the other hand Tatsuki Machida surprisingly got on the podium with compatriots Kozuka and Hanyu at Skate America, and more surprisingly won Cup of China over Takahashi. The competition here is going to be very challenging even because none of these skaters are completely solid on their jumping elements but they have all very risky programs. I would predict that Hanyu will have a great short program compared to others but he is kind of a rollercoaster in the free skate being able to fall even on a spin. Patrick Chan probably remains the favourite in the men’s field if he doesn’t bomb as he did at Japan Open.